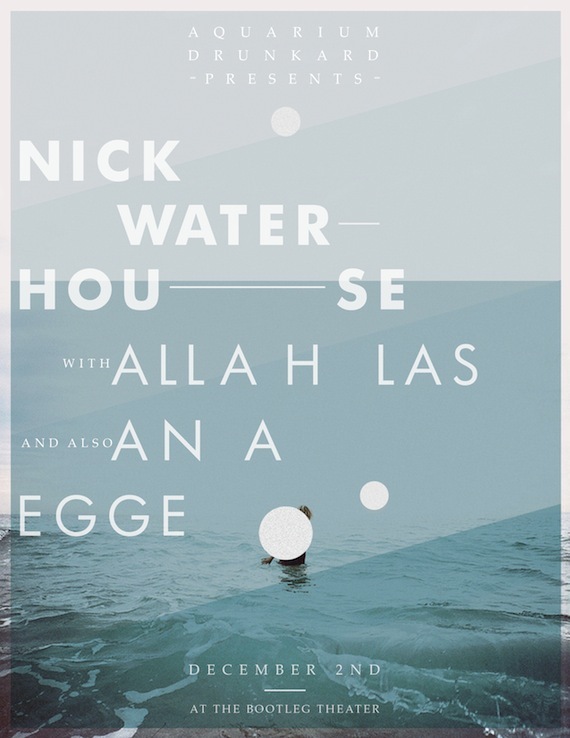 Friday night, December 2nd, Aquarium Drunkard presents Nick Waterhouse with the Allah-Las and Ana Egge at the Bootleg Theater in L.A. We have three pairs tickets for AD readers. If looking to go, leave a comment below with your name and an email in the address field (its hidden from the public) we can reach you at. Winners notified by Thursday; tickets held at will-call. The Allah-Las single is one of the best of the year! Can’t wait for the show! Want to see Nick Waterhouse. I’ve somehow managed to miss him every other time he’s played in LA. If you’ve got one more left, I would love to go. I would love to go to this show, Nick’s sound is great and the Allah Lah’s are another band I’ve started to get really into. Love Nick Waterhouse and The Allah-las & would really dig seeing them both at an awesome little space like the bootleg! Perfect venue for this band. Cannot wait. I’ve missed him the last few times in LA, too, would love to go this time since I am actually available! I am obsessed with Nick Waterhouse and would love to come to this! I heard both, Waterhouse and Allah-Las, on Sirius radio and instantly fell in love. I’ll take the night off work to go see these guys. I love the vintage R&B and they do it right. Yes! would love to see Nick and his buddies the Allah La’s. Perfect way to kick off the festive season. Would love to go! New to the neighborhood, and what better excuse to check out the Bootleg?! I’ve heard great things. Oh my gah, puh-leeeease tell me I have even a slight chance of getting those tickets. Can’t wait!! Friday’s gonna be more awesome than awesome!!! ooooh! pick me pick me pickmepickmepickme!! waterhouse burns pianos into ashes, and the allah-las give me le goosebumps. this is that dose of funk that i’ve been needing while waiting for king khan to get back to US soil (and not get arrested on the way to LA)….. The Bootleg on Friday is Some Place I’d rather be! Is That Clear, AD? I would love to go, if possible. Cheers. This is going to be awesome! Pick me!! don’t wanna miss this show! promise ill be the happiest girl in all the bootleg theater if you pick me…!